Rio de Janeiro, commonly referred to simply as Rio, is the capital city of the State of Rio de Janeiro, the second largest city of Brazil, and the third largest metropolitan area and agglomeration in South America, 6th largest in the Americas, and 26th in the world... . It’s the most visited city in the southern hemisphere and is known for its natural settings, carnival celebration, samba, Bossa Nova and less but not least its beaches. 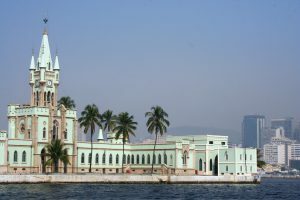 Rio is inhabited by a colorful mixture of European, African and native peoples. They are a friendly bunch and are always ready for a chat and a cold beer. Rio has a tropical climate with an average temperature of 26C. Foz do Iguaçu makes up the border with Argentina and Paraguay, but its main attraction is without any doubt the majestic waterfalls. The Falls of Iguaçu are classified world heritage by Unesco since 1986 and are a must for the nature lover. They are the most impressive waterfalls in the world and also the biggest and are the result of the confluence of the rivers Parana and Iguacu. The water body plunges 65 m. deep, over a 4 km wide geological crack where it comes thundering down with an ear deafening sound into a natural amphitheater. Foz do Iguacu has a sub-tropical climate with temperatures that can plummet to -5C during the European summer and that can reach as high as 40C during the European winter. Buenos Aires is a vibrant city, known for its art, culture, nightlife and friendly citizens. You have to impression of strolling through a European city and that’s where the name: “Paris of South America” has its origin: whine, tango, belle époque are omnipresent. Its South America’s most populated city after Sao Paulo and its port is one of the continent’s most important. The inhabitants or “Portenos” are mostly of Spanish and Italian origin and they are off course convinced they have the best football team in the world. Buenos Aires has a humid sub tropical climate and has 4 well defined seasons with temperatures ranging anywhere from 8C to 30C. Arrival at the airport, meet and greet by our guide and transfer to Windsor Leme hotel OR similar. Check-in assistance. (Check-in: 14h / Check-out: 12h). Overnight. After breakfast, pick up by your local guide for visit of the famous Corcovado Mountain. Towering 700 meters above the city, with Christ the Redeemer on top, the Corcovado offers a 360 degree view of the ‘Cidade Maravilhosa’ that is simply breathtaking. Once our visit of the Corcovado is finished our bus will take us for a panoramic visit of Rio’s most exquisite beaches; Sao Conrado, Leblon, Ipanema, Copacabana. Overnight. After breakfast our guide will pick you up and we will head for the Sugar loaf. We will than take the cable car and enjoy the wonderful aerial view of Copacabana beach and downtown Rio de Janeiro. We continue the morning with a panoramic visit of downtown Rio, Cinelandia, its Imperial Palace, the Sambadrome and Maracanã stadium. Overnight. Breakfast and free day for leisure. Overnight. Breakfast and transfer to the airport for your flight to Foz do Iguaçu. The duration is about 2 hrs. (Direct flight) and upon arrival you will be greeted by your local guide who will accompany you to Vivaz Cataratas hotel OR similar. Check-in assistance. (Check-in: 14h / Check-out: 12h). Overnight. After breakfast, transfer to the National Park to visit the Brazilian side of the falls. Located on the border of 3 countries - Brazil, Argentina and Paraguay, the Iguaçu falls, classified by Unesco as `World heritage`, are a must see for those passionate about nature. 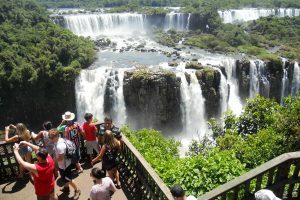 Upon arrival in the National Park the guide will walk you towards the Brazilian part of the falls. 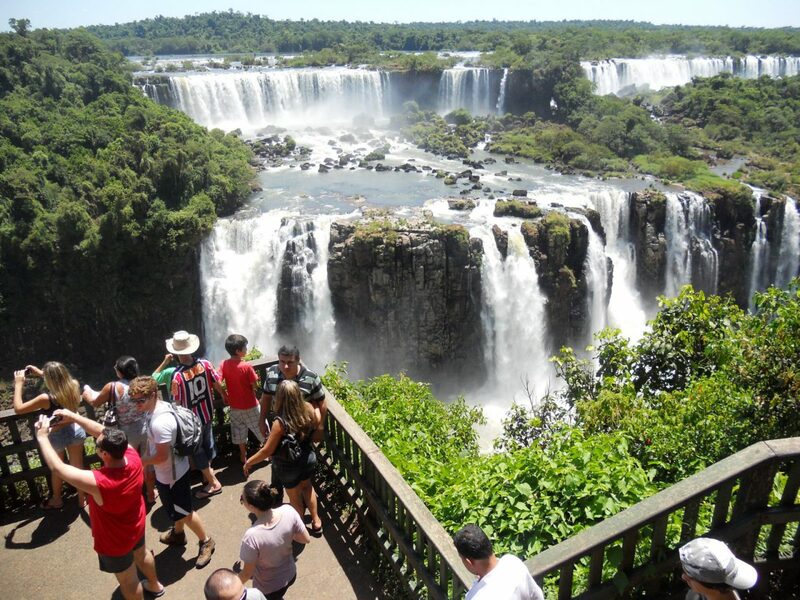 You will have a chance to see the approximately 280 falls that cover Brazil and Argentina from several points. The majority of the falls are on the Argentinean side, but the spectacle is definitely Brazilian. There is enough free time to take magnificent pictures. Overnight. After breakfast, departure for Puerto Iguazu and the Argentinean side of the falls. The saying goes that the Brazilian side is more spectacular, but the Argentinean side is without any doubt more impressing: a 600 m. long, luscious jungle trail leads to the beginning of the falls. From the 19 bigger falls, 16 are on this side of the border. We will visit all 3 levels, including the famous ‘Garganta del Diablo’, offering a vertical view from the top of the falls. Be aware that passport/visa is needed for Argentinean border crossing. Overnight. Breakfast and transfer to the airport in Argentinean side (Puerto Iguazu) for your flight to Buenos Aires. Upon arrival, meet and greet for your local guide and transfer to Savoy hotel OR similar. Check-in assistance. (Check-in: 12h / Check-out: 12h). Overnight. Breakfast and pick up for the tour of the day. The City tour gives you the emotion of a multiple Buenos Aires. 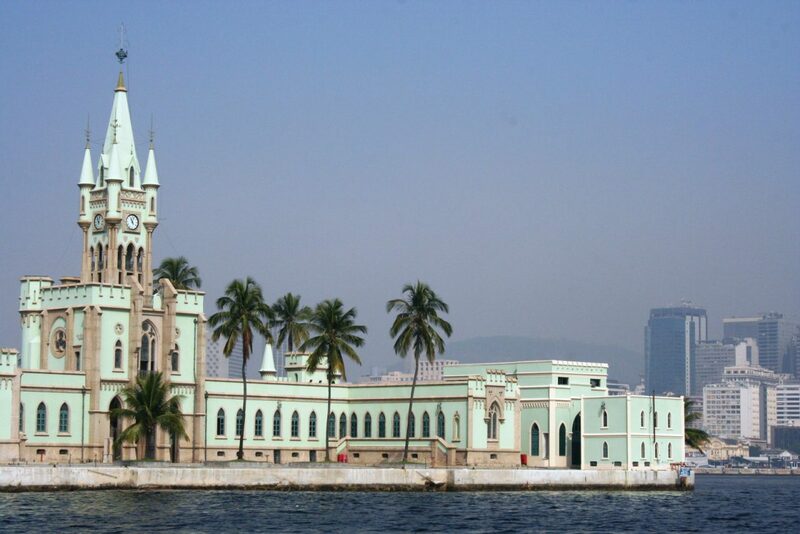 During this tour we will learn about the history of the "Paris of South America" as it was know in the last century. 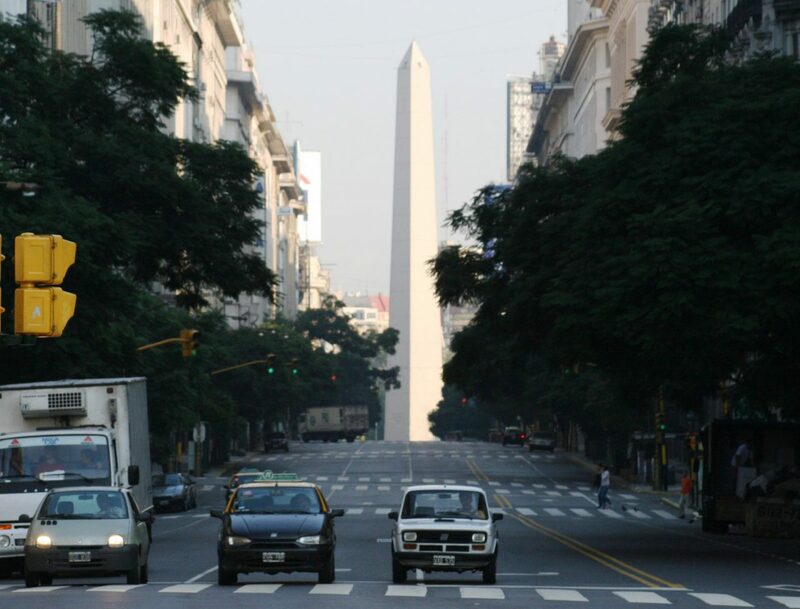 We will see the symbol of our city: the Obelisk and we will visit the main square where the city was founded in 1580 : Plaza de Mayo. 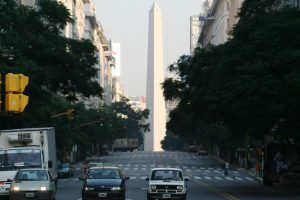 We will drive among some of the most important avenues, such as Corrientes, Mayo and 9 de Julio (the widest one in town). We will pass through historical neighbourhoods such as: La Boca, San Telmo & Montserrat. Elegant neighbourhoods such as Palermo and Recoleta, and the most modern one: Puerto Madero. Green areas such as Tres de Febrero Park. We will also visit financial and commercial areas and we will get to one of the most famous Football Stadium, La Bombonera. Overnight. Breakfast and transfer to the airport for your outbound flight. Our guide will assist you with your check in formalities. Rates are not valid for Reveillon, Carnival, Champions Parade, Easter and National Holidays.